A credit card is required to schedule an appointment for any service(s) over $50.00. Please arrive at least 15 minutes before your appointment to review your schedule and fill out the necessary paperwork. Should you arrive late, your appointment may be shortened or rescheduled to allow the therapist to be on time for his/her next client. Although massage and body treatments require the removal of clothing, respect for your privacy is our primary concern. Undergarments may be worn if preferred. Professional draping procedures are observed at all times, and we encourage you to communicate any discomfort to your therapist. For your convenience spa robes, slippers, showers, and lockers are available. To preserve a peaceful experience for everyone, cell phones and wireless devices must be turned off in the spa. Lockers are provided for personal belongings. We may not be held responsible for lost or stolen articles. Prices do not include gratuity. In appreciation of the staff for outstanding services, gratuities may be given at your discretion. A 18% gratuity will automatically be added to groups of 6 or more. Spa Parties: An 18% gratuity is automatically charged for all Spa Party services. In appreciation of the staff for outstanding services, further gratuities may be given at your discretion. Prices are subject to change without notice. We gladly accept cash, personal checks, VISA, MasterCard, Discover, and Coventina Gift Cards. A $25 fee will be accessed for returned checks. To avoid charges, please honor our 24-hour advance notice cancellation policy. If the 24-hour advance notice cancellation is not followed, you will be charged the full amount of your scheduled service. Spa Parties: A credit card number will be taken to reserve all Spa Party services. To avoid charges, please provide a 72-hour notice for cancellations and changes. Late cancellations and no shows will be charged the full amount of the services. Unused retail purchases may be returned or exchanged, within one week when accompanied by the original receipt. We will be glad to provide your party with coffee, water, or tea, as well as plates, silverware, wine glasses, and a refrigerator to store your food. We have also partnered with a catering service to offer you delicious hassle-free food at a 10% discount. Alcoholic beverages are permitted at the spa, but we insist that you drink responsibly. If you are not completely satisfied with your service, please contact our management. We will do our best to exceed your needs because we truly appreciate your business. All service providers at Coventina Day Spa are licensed professionals, who strictly adhere to the state mandated policies and procedures. State law requires those aged 16 and 17, who wish to receive massage treatments, to be accompanied by a parent or legal guardian during the treatment. 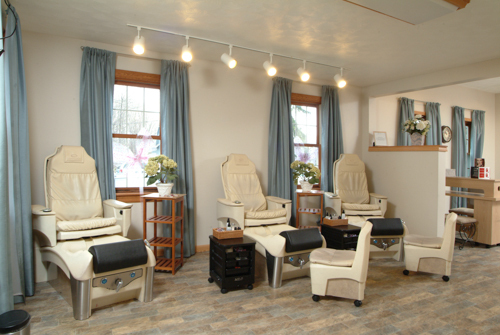 For these occasions, may we suggest our serenity suite where adult and teen receive treatments side by side. We also offer a chair massage with the teen fully clothed and resting in a semi upright position. We appreciate your full compliance with these policies. Coventina Day Spa reserves the right to deny treatment to those who appear to be under the age of 18 without a parent present. Coventina Day Spa Gift Certificates are the ideal gift for any occasion. Gift Certificates may be purchased in any denomination to use towards services or products of choice. Gift Certificates are non-refundable. Please treat gift cards as you would cash. Lost or stolen cards cannot be replaced.